In a tiny basement in Union, New Jersey, a suburban town 40 minutes from Manhattan, Marie Rossettie peers over her tangerine-orange glasses at her artwork of a bleeding heart before blasting it with a blowtorch. 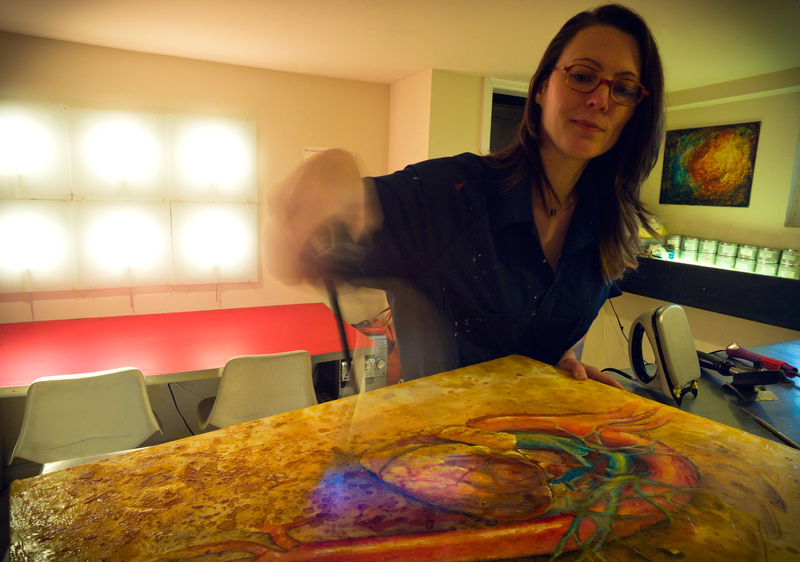 Using a method called encaustic painting, she melts special wax paint and applies it to a canvas board. When reheated, colors become luminous and textures develop unexpectedly — ranging from pebbled to serpentine ripples. The technique was used by the Egyptians to make detailed portraits on mummies, but Rossettie has found a 21st Century application of the unconventional art form: medical illustration. Medical illustration is a niche profession, best suited for creative individuals who are conversant in both science and the arts. They are often the ones behind the images in science textbooks, journal publications, surgical manuals and instructional animations. Before jumping into medical illustration, Rossettie spent many years as an emergency medical technician (EMT) in cardiac units and operating rooms. Her fingers are as nimble as a surgeon’s. But instead of scalpel and needle, Rossettie wields sketchbooks and oil paints. She prefers beginning her projects with paper and colored pencils before scanning them into Photoshop for refined edits. Since earning her master’s degree in biomedical visualization from the University of Illinois at Chicago in 2005, Rossettie, 38, has created anatomy art databases for hospitals, diagrams in doctor offices and even used patients’ MRI data to make 3-D visualizations of cancer progression for a legal case. BJ Warshaw, Rossettie’s boyfriend of seven years and occasional creative partner, admires how Rossettie successfully blends classical and new artistic techniques. “She’s fascinated by people from the inside and out, and that comes through in her artwork,” Warshaw said. As a child growing up in a little town in west New Jersey called Chester, Rossettie always enjoyed the gross and gory. Her older sister would faint at the sight or thought of blood, Rossettie recalls. “Whatever is broken in my brain, she has in hyper-drive in her brain,” she said of her sister. She felt right at home in both her high school art and anatomy courses. At 17, she tagged along on her sister’s tour of the University of Michigan, where she noticed a display from the university’s medical and biological illustration graduate program, which was discontinued in 2004. Rossettie stood in awe in front of the massive glass case filled with old grotesque medical drawings and diagrams. Rossettie went on to attend Hampshire College, a liberal arts university in Amherst, Massachusetts that focused on portfolios rather than restrictive majors or a rigid grading system. There Rossettie mixed her interests in art and medicine, and created an interactive exhibit on the human body for her senior show. After graduating, she spent three years rebuilding her portfolio, which had been destroyed by flooding in 2000, and taking prerequisite courses for medical illustration. On the side, she worked as a surgical technician at Overlook Hospital in Summit, New Jersey, where a surgical resident asked her to draw the illustrations for his paper on a new procedure for atrial fibrillation, or irregular heart synchronization. “I did the illustrations and I was excited. I had successfully taken his scribbles on a napkin and turned them into an actual body of work,” she said. Rossettie was able to refine her skills at the University of Illinois in Chicago’s biomedical visualization program. She took intense courses in the medical school all while taking 3-D animation and figure drawing. Rossettie found herself among future physical therapists and physicians, who were shocked that they had to share cadavers with artists during anatomy class. In her classes, she learned that 3-D visualization was dominating the market. “I think it’s a great moment in time to be in a field with changing technology where you can use radiology and MRI data — that’s crazy,” she said. But Rossettie favored the aesthetics of classical two dimensional illustration. Rachel Bajema, a medical illustrator and 3-D specialist on the West Coast, befriended Rossettie during graduate school. Rossettie “knows herself and what she wants,” Bajema recalled. “She just said, ‘I don’t want to do 3-D. I understand that the market is there, but … I want to seek out other clients that want what I do.’” Her determination paid off as Rossettie gets enough business to keep two dimensional artwork the focus of her company, Left Right Brain. Aesthetic freedom helps in establishing a unique trademark, Rossettie said, but accuracy is extremely important in medical illustration. She learned this after receiving a call from the surgical resident at Overlook Hospital informing her that patients were dying from the procedure she had illustrated: surgeons were puncturing through the heart wall and into the esophagus. “That was the moment where I realized this was real. What I create can actually affect the outcome of people’s care,” Rossettie said. She made a new illustration to remind surgeons of how delicate and thin the wall is. Today the procedure is much safer and commonly practiced. Rossettie’s pieces have been featured in the Association of Medical Illustrator’s annual salon, encaustic shows and photography exhibits. She is also one of four artists displayed at a medical illustration exhibit in surgical and molecular biology conferences currently being held in Japan. While Rossettie also likes to paint scenic murals and portraits of friends, she still comes back to gruesome subjects. Wonderful article so proud of my niece Marie’s accomplishments. She is very talented.